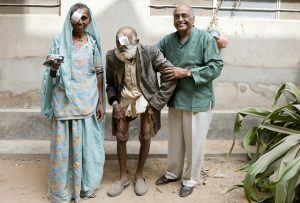 Suresh Chandra, MD founded Combat Blindness Foundation in 1984. He has authored more than 165 publications and ten book chapters. He is also a Council Member of Vision 2020: The Right to Sight, a global joint initiative of the World Health Organization (WHO) and the International Agency for the Prevention of Blindness (IAPB). Dr. Chandra is currently the Director of the Division of International Ophthalmology at the University of Wisconsin-Madison School of Medicine and Public Health. He’s been a professor in the Department of Ophthalmology and Visual Sciences since 1974. Dr. Chandra’s research interests center around clinical trials for macular degeneration, diabetic retinopathy and other retinal diseases. He has served as Principal Investigator for the landmark Age-Related Eye Disease Study (AREDS), which investigated the effect of antioxidant vitamins and zinc on macular degeneration and cataract, and is now lead investigator for the AREDS2 project, among others.